December | 2017 | TODAY IN BIGFOOT HISTORY! While collecting snow samples for a rainfall survey, amateur meteorologist Dave Walker stumbled upon a rare and fabled phenomenon. Walker, like all West Virginians, had heard the stories as children about the extensive tunnels that Bigfoot dig in the winter. But no one he ever knew had actually found any of these fabled tunnels. But Walker claims he found some. He described them as wide as they were tall and walls and ceilings were covered in a thin layer of ice. The floors of the tunnels were tightly stamped down by the massive bigfeet of numerous Bigfoot. There were great and clear foot impressions on the floors of the tunnels. Walker followed the tunnel for about half a mile before becoming frightened and doubling back. While camping in the Petosky Park, Michigan native Lou Hutchings saw something he will never forget. While he was hiking around around his campsite, he heard a commotion a few yards ahead of him. It sounded like a large animal struggling to get up – twigs snapped, leaves rustled, and there was a low groan. As Hutchings approached, he saw an 8 foot Bigfoot slowly getting to its huge feet. The Bigfoot was using a tree for balance. Then the creature took a few cautious steps, before its bigfoot big toe stubbed against a tree root that stuck up out of the dirt. Hutchings watched in horror as the monster tumbled forward. The Bigfoot landed face first on the ground with a tremendous thud. The creature rolled over on its back, placed its hands behind its large head, and acted as if it meant to lay down and look up at the clouds. Hutchings feared the the Bigfoot would be angry and embarrassed if it saw him giggling at it, so he slowly made his way back toward his campsite. MERRY CHRISTMAS FROM OUR RESEARCH OUTPOST TO YOURS’!!! Daniel Dornhaus was hiking through an isolated area of Pharaoh Lake. He stopped to try to identify a bird he saw on a tree a few yards ahead of him. Suddenly, the tree trunk near the bird was hit with a smack by a snowball. The startled Dornhaus yelled out in anger at whomever threw the snowball. He pulled his scarf tighter and stated to walk away when a tightly packed snowball pelted him in the back of the head. The snow went down between his jacket and shirt, something that always annoyed Dornhaus when he was a kid in snowball fights. Dornhaus started yelling for the snowball thrower to show himself. When there was a terrific howl, a long guttural laugh, then like 15 to 25 snowballs came flying at Dornhaus, all at once. Most missed, but a few hit him. One knocked his hat off. Dornhaus was incredibly angry now and started swearing and cursing. A large brown Bigfoot peeked out from behind a big mound of snowy bushes. The creature seemed to wave and smile at him, before chucking a snowball directly at Dornhaus. Surprised for the second time that day, Dornhaus took off running as snowballs continued to fall around him and hit trees near him. Noelle Powell was staying with her two dogs in a cabin in the Russian River area. She got up in the middle of the night because her larger dog, London, was barking like a crazy person. Powell, more scared of Meth head hillbillies than any sort of creature, looked out the window where London was furiously barking. Powell saw a Bigfoot leaning over the uncovered hot tub on the side of her cabin. 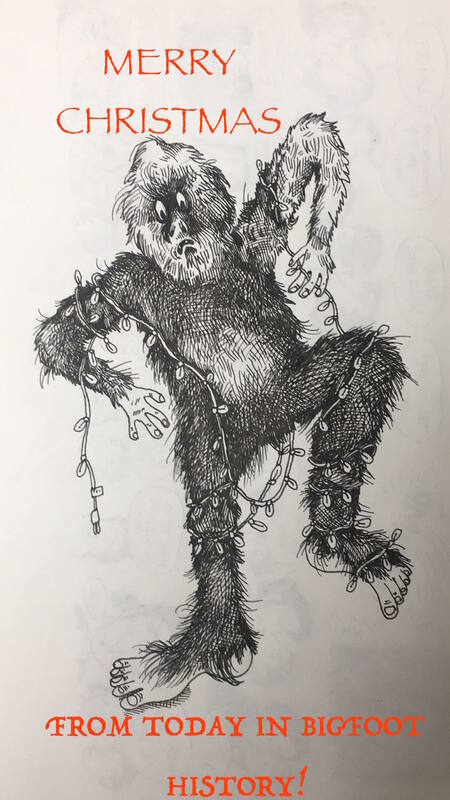 Powell described the creature as incredibly hairy, over 12 feet tall, and with glowering red eyes. She knocked on the window. The creature looked up with hot tub water dripping down its furry face. Powell yelled at the creature through the window to stop drinking from the hot tub, that that water was nasty. The Bigfoot, clearly, confused by the reprimand, slowly backed off into the darkness. Tom and Jenny Apline pulled into a RV park near the Greenbelt Reservoir. They had not even really started to unpack the car for the night. Tom was stretching his legs, while Jenny walked toward their brand new 19 foot Trailblazer Winnebago Travel Trailer. Jenny was just about to open the trailer door, when a giant man creature came roaring out at her. It seemed to have jumped down from on top of the trailer. But Jenny was not totally sure about that. The creature waved its arms before kicking out the trailer hitch. The hairy monster grabbed the hitch and started to pull the 19 foot trailer off into the woods. Tom came running over and yelled at his wife to get away from the Bigfoot. Tom was less worried about their new mobile home than he was about losing his wife to the Bigfoot. Because Tom knew the stories about Bigfoot kidnapping women to make their forest brides. Tom and Jenny stood there watching as their massive new recreation vehicle was dragged off into the woods, never to be seen again.